Gladys Liu and Liberals team that realizes the promise..
Dear readers, Falanga represents Gladys Liu, candidate of the Liberals. Gladys immigrated to Australia in 1985 to study Speech Pathology at La Trobe University. After graduation, Gladys went on to work in the not-for-profit and education sectors before establishing her own speech pathology clinic. Most recently Gladys worked for the Premier of Victoria in multi-cultural affairs. She accompanied Premier Baillieu in 2012 Super Trade Mission to China and accompanied Premier Napthine in April this year to China as part of the Prime Minister Abbott’s China Trade Mission. Having called Australia home for the last thirty years, Gladys is passionate about serving and giving back to her community. She is an active community member and takes a particular interest in helping those of culturally and linguistically diverse backgrounds. Gladys is currently an AFL Multicultural Ambassador and an Asian Cup Multicultural Ambassador. Northern Metropolitan Region is made up of 11 lower house electorates comprising 66 suburbs. It stretches from Melbourne and Richmond in the south to Yuroke and Mill Park in the north. 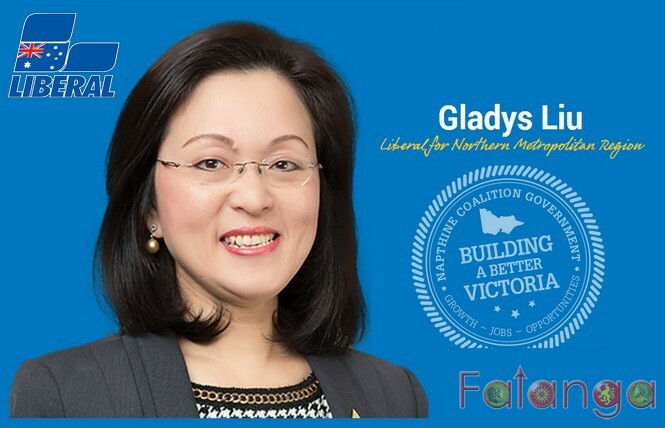 Gladys is totally committed to the Northern Metropolitan Region of Melbourne. She will fight for cheaper public transport and more community services, as well as encouraging local job creation by supporting the local economy. Gladys will also ensure the multicultural communities of the Northern Metropolitan Region are represented and their interests and concerns are heard.